David Arthur Ernest Owens was born 1899 and attended George Heriot’s School from 1909 – 1915. He played rugby for the school. On leaving school, he was employed by Messrs. Cole & Co., electricians. He was in the 53rd Training Reserve Battalion in January 1918; served in France, June 1918, and was attached to the Scottish Rifles. He was killed in action on 29th July 1918. 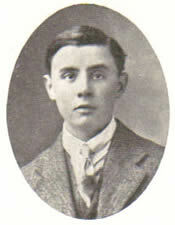 He was the younger son of Mr and Mrs George Owens, 87 Bruntsfield Place, and died aged 18.